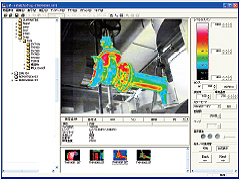 Thermo Tracer TH9100MRI/WRI | Infrared Thermography | NIPPON AVIONICS CO.,LTD. Movie image recordable!! Easy measurement of fast changing objects. 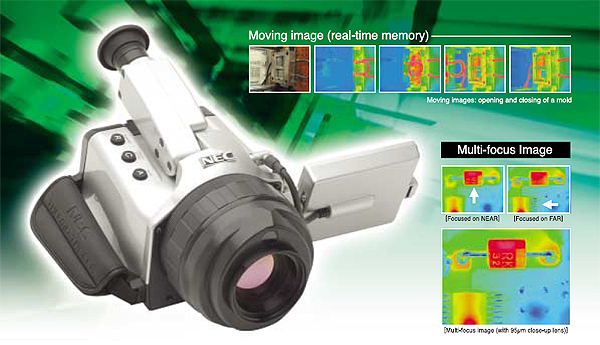 Measures visual and thermal images simultaneously and displays the fusion image for easy identification of thermal spots. Automatically corrects parallax of thermal and visual images. Clear and sharp images can be obtained by reflected light at daytime and backup light at nighttime. Voice memo can be recorded up to 30 seconds per image. A fresh reminder of the field condition. Emissivity correction Provided (0.10 to 1.00). Emissivity table provided. **Specifications are subject to change without prior notice. **Described company name and model are brand name or registration of trademark. Helps to make reports easily with thermal images and temperature data on MS Word and Excel. Fusion of thermal and visual images. Detects abnormal temperature by max/min temperature display. Direct data transfer to MS Excel. 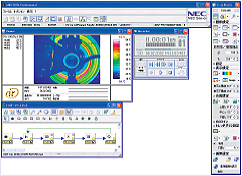 Helps to acquire real-time images via IEEE1394 or Ethernet.